Manage larger items and all your most oversized stuff with the Milwaukee Dual Handle Hand Truck with Nose Plate Extension. Its 800 lb. weight capacity and fold-up nose plate extension make it possible to handle cumbersome loads. Features 10-inch puncture proof tires and measures 20L x 20.5W x 45.5H inches. An excellent tool for moving big potted plants around! 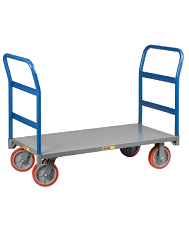 Needed a Hand Truck to move product and the Milwaukee Hand Truck was what we needed it did a great job. Thank you! I use this cart for service calls that require me to move heavy equipment long distances. I love the fold down nose that allows me to transport more, larger, and oddly shaped objects with ease. The only thing that I see where it can be improved is the velco strap that holds the nose up when not in use. It needs to be mounted more securely.